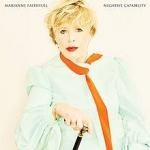 Share the post "Album review: MARIANNE FAITHFULL – Negative Capability"
With a recording career spanning over fifty years ‘Negative Capability’ is Marianne Faithfull’s twenty-first album. Battling arthritis, contemplating bereavement and dealing with loneliness, it’s a highly autobiographical and emotive offering from Faithfull. “It’s the most honest album I’ve ever made,” she says. “I’ve always tried not to reveal myself. Faithfull’s voice today is a world away from the soft, gentle, wistful lead vocal the world fell in love with when ‘As Tears Go By’ was released back in 1964. Her vocals, aged, deepened and absolutely full of life, love, loss, tragedy and reflectiveness, these songs are delivered with 100% sincerity and conviction. For those wanting to make comparisons, Faithfull even returns to her iconic 1964 Jagger & Richards interpretation, one of two covers on the album, alongside Bob Dylan’s ‘It’s All Over Now Baby Blue.’ Of the new material, the aforementioned collaboration with Cave, alongside the majestic ‘In My Own Particular Way’, the haunting ‘Witches’ Song’ and ‘They Come At Night’ (co-written with Mark Lanegan) are all absolute stand-outs. This entry was posted in ALBUM REVIEWS, ALBUM REVIEWS (Mobile), All Posts and tagged album, Ed Harcourt, Marianne Faithfull, melodic, Negative Capability, Nick Cave, pop, review. Bookmark the permalink.